I agree! 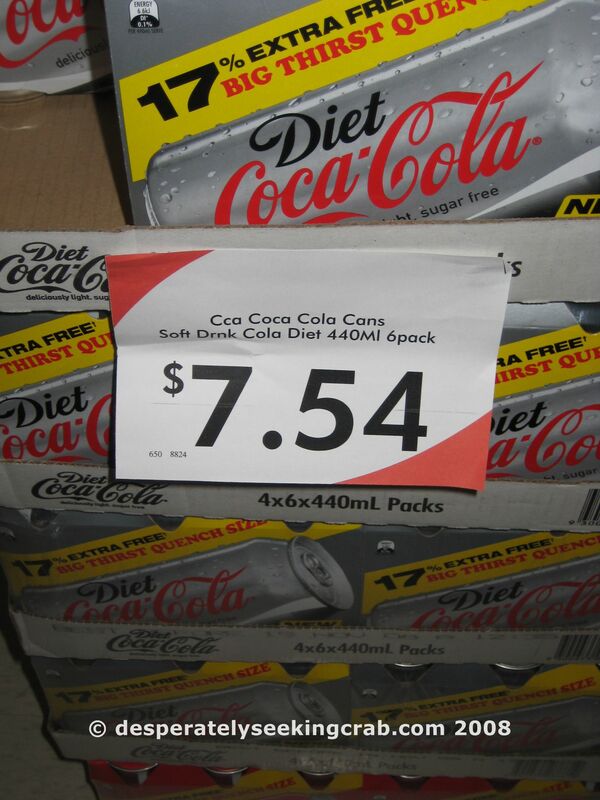 I was shocked by how expensive coke is when we first moved to AU. In fact, some times I’m STILL shocked. The 7/11 near my place in Bondi Junction sells a 600ml bottle for 3.50. I could get a 6 pack of diet coke for that much in the States. But, the price has helped me cut WAY back on soda, so it’s really a very good thing. More like the “true” cost of the food. Hey Michelle, I had no idea it was so expensive in america. I thought it was funny you write soda, i’m not used to hearing that. Here, soda is like soda water. I grew up calling it “cool drink”, so i’m learning things from your blog all the time. Hehe soda. I’ll have to try that one out. The best thing we ever bought was a water filter, it cools the water and filters all the bad tastes out but leaves the fluoride and essentials. Because it’s always cold, we just walk past and get a drink. Yasu has cut down his soda to just about nil, and i hardly ever drink it either. Before that we consumed about one 1.5 litre bottle per day!! It was pepsi max or coke zero, but it’s still pretty bad…at least now we are much healther. I have lost 5kg just from switching from soda to water. 🙂 It’s economical too as we use tap water for filtering, so all those bottles of drink not being bought by us are resulting in more money in our bank. 🙂 Great post. Azumarisan, did you mean “I had no idea that it was so INexpensive in America?” Soda is DIRT cheap in America. Good to hear you have a water filter. We used to have a Puratap at our old house but we can’t have it here. We use a BRITA water filter now at home…not as good but still good. You need to get with the times, sister. Australia recently passed the United States for the title of the world’s fattest nation. Thanks for that link. I hadn’t actually read about that. Per population AU is fatter than the US but honestly, you just don’t see the same KIND of obesity as often in Australia as you do in the states. I still think that in the US, there are way more GROSSLY and MORBIDLY obese people than in Oz. Soda is definately a huge contributor to obesity in the US, as are all refined carbohydrates. Our health education in the states in the US is so warped. In the schools in CA they have taken out soda and replaced high fat chocolate chip cookies with low-fat ones-but they are still high in sugar! Fat is still considered the enemy but refined processed carbohydrates are not. So, the high sugar cookies are deemed ok, whereas the high fat ones are not. Neither are healthy. If the US wants to reduce it’s obesity Americans need to start eating unprocessed foods. There needs to be a focus on vegetables, low-fat proteins, and the right fats (oils vs. animal fats and hydronated fats).